The following was copy-and-pasted from THE ENGINE from a post in the CREATOR’S CONFERENCE by Matt Fraction titled “the shelf”. almost this time of year, two years back, i was asked to speak at a design conference in memphis. the event’s keynote was a guy named marc english and he gave a lecture– really more of a multimedia explosion with gutiar solos, alienated russians, pocket glitter and slides– called THE WAY OF THE DESIGN SHAMAN. What he did, basically, was present a narrative around the visual catalog of his life– illustrations from books he owned as a kid, first album covers, etc., reflected in the work he does now as a, well, design shaman. The legend (map legend, i mean, although the legend-legend meaning is maybe just as descriptive) of Marc’s life was all there– starbelly sneeches from his fifth year of life echoing out intp packaging he’d done for Criterion the week before and on and on. It was a revelation to me then. The heavy water in my head had been putrifying and meeting marc set it slowly to a boil. the idea of doing some kind of personal archeology led me to reignite and reconnect with Where You Get Your Ideas. As such, this time of year, I start to try and dig up all that stuff and revist it, even if it’s just for a moment. Soak up the source a little bit and spin it off into the new year. It’s become an important part of my process, or at least the winter. So the other day instead of writing i had very important stacking and arranging to do in my office. You know how i do. And so on the shelf nearest to me (well, not nearest-nearest, as that’s full of lincoln and civil war books, but nevermind) I figured I’d put the books most responsible for me wanting to make comics. Not necessarily my favorite books, or the only books I loved, but the books that, for whatever reason, made me ache to make the goddamn things. If you had to put together a shelf of the books that inspired you to make comics, what would be on it? There are a lot of different things that have been burned into my psyche. Things that I’ve carried around in my head to this day which influence the way I think, and inspire the things I create. Personal archeology; that seems as if it would be a worthy excercise, and one that would fit well with this blog journal experiment. In the coming weeks / months my intention is to assemble my own personal list (or shelf) of those things that inspired me. The next strip is done. Finally. I was trying to get this thing finished all week. Each morning I told myself “okay, even if you just get one panel done, just get it up there and post it!” And of course, even the completion of a single panel would elude me. Also in this strip, I experimented with colouring the background greyscale with pantone markers, thinking it might save me some time in the long run… Wrong. The grey tones I used were too light, so that when I tried to colour correct the strip in photoshop, I either got stuck with the white page being left as a light grey with the pencil lines showing through (making it look even sloppier than what is shown below), or losing the grey tones completely. Mental note for next time: I’ll have to use a darker grey so I can bump up the brightness and contrast in photoshop to blast out the pencil lines while retaining the marker grey tones. A member of the Spy Guy Street Team has discovered a series of embedded symbols cunningly laid out and interwoven into the nation’s architecture which when viewed by the inititiated communicates a powerful hidden message. 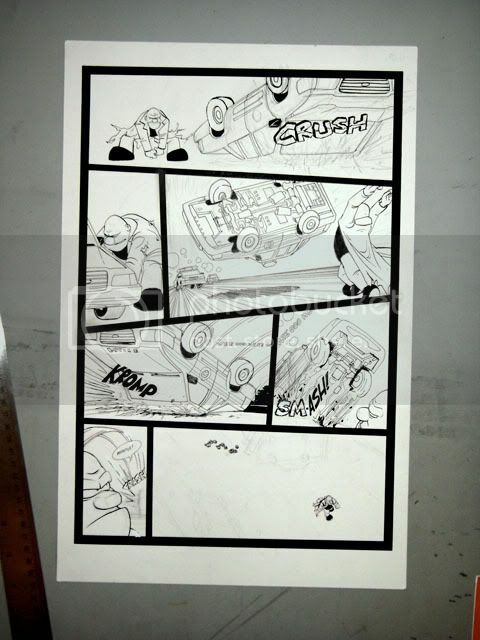 – SPOILER WARNING – The following page is a work in progress from the upcoming SPUD & HARRY #1. Click image to enlarge. So, in today’s episode we have a character whose design is a blatant rip off of said Shane Glines. I was curious how that style would mesh with my existing Spy Guy Universe style. I experimented importing a manga style into the Spy Guy universe with my Hat Attack comic strip from SPY GUY: Minis. That one turned out okay, so I figured this one would too. Last week was plagued with problems, such as job change and computer crash. So tonight I stay up late to get this next comic posted. Need to push past these set-up story panels so we can get to the action! It’s coming… hang in there.